Ultra high strength steel belts, micro-fiber casing reinforcements, and broad tyre contour provides even treadwear for longer mileage and confidence in challenging conditions. 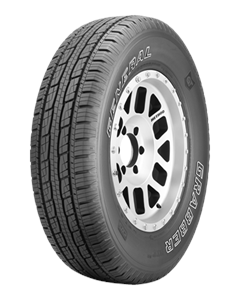 A flatter footprint, optimized tread pattern stiffness and an improved tread compound provide up to 25% more tread life than the original Grabber HTS. Tread cushioning system combined with sound barrier ribs provide a more comfortable, quiet ride. Metric sizes are optimised for excellent grip in wet and winter conditions, while LT sizes are optimised for improved tread life and stability under heavy load.